Weaning your baby onto solid foods can be done on a continuum from very structured to totally unstructured. 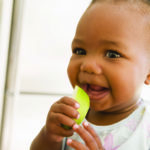 Dietician and lactation consultant Deidre Lindeque walks us through baby-led weaning. Baby-led weaning (BLW) is a somewhat cheesy term for just letting your infant self-feed. You cut food up into manageable sticks and offer it, and they eat. It’s really very simple. 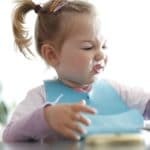 It’s ‘baby-led’ in the sense that you let them do what they need to do while they’re learning, and as the parent you resist the urge to get wound up in knots about how much they’re eating, whether they like the food you thought they’d like and whether it’s mashed into the nearest carpet. The main thing is … it’s all good clean (messy) fun. Forget ‘baby food’. Food is food – as long as you’re not adding salt and sugar. To start off with, thick chip-sized foods are great because this is an easy shape for six-month-olds to grip, but you’ll soon move on to smaller pieces as these are more interesting for a child developing a pincer grip. No bowls: they’re just asking to be flung heavenwards. 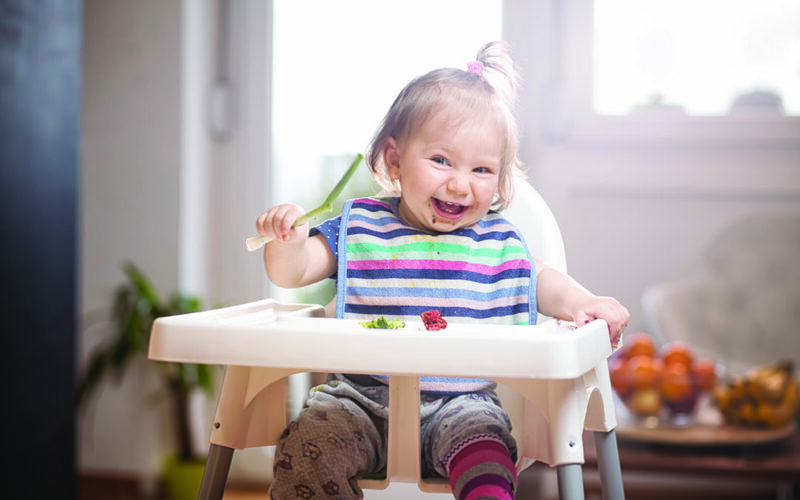 Put the food on the highchair tray or table and remember, it’s all a messy learning experience for the baby at this point. There will be mess! If you are weaning in summer don’t be afraid to let your little one eat outside, in just a nappy. For winter invest in a great coverall bib. Putting a wipe-clean tablecloth under the highchair is a good idea if you have carpets, and some people find that a crinkle cutter is handy to make food extra-grippable. Experience suggests that the more effort you put into making something special for the baby, the less likely they are to eat it! Just adapt the food that you are having. Of course it would be perfect if we ate every meal as a family, but this isn’t always possible. Try to share meals with your little one as often as you can. Keep smiling, keep enjoying your food and keep engaging with your little one. It’s just good manners: something it’s never too early for a child to learn. When you start, don’t put too much on the highchair tray at once. Just a couple of pieces of food will stop them feeling overwhelmed. Actual hunger can be frustrating for little ones when they’re still getting to grips (quite literally) with things. Timing ‘meals’ to happen between milk feeds seems to be best, and because it’s just finger food, you aren’t limited to staying in. There’s no reason why you can’t pack a small container with some cucumber or mango slices, buy a banana when you’re out, or just pull some bits out of an undressed salad. 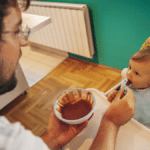 Have a camera ready to capture those first gummy, carroty smiles, because as daunting as it may seem, weaning is a very short time in your child’s life. So remember to enjoy it. Steamed (or lightly boiled) whole vegetables such as green beans, baby sweetcorn, mange-tout or sugar-snap peas. Steamed or lightly boiled florets of broccoli or cauliflower. Steamed, roasted or stir fried vegetable sticks such as carrot, pumpkin, butternut, potato, aubergine or sweet potato. Raw sticks of cucumber (great when straight from fridge to ease the gums of teething babies). Thick slices of avocado (not over-ripe or they become very soft and squishy). Fruit such as pear, apple, banana, peach, nectarine, halved grapes, pawpaw, mango – either whole or as sticks. Cheese – sticks of firm cheese such as cheddar or gouda, as well as cubes/triangles of full fat cream cheese. Cooked pasta shells or shapes, balls made of cooked rice, small pieces of toast fingers or bread sticks and rice cakes. Mini sandwiches cut into triangles, fingers or squares – suitable fillings include mashed banana, hummus, grated cheese, cream cheese, mashed avocado, nut butters. Falafels, lentil balls and mini meatballs – beef, chicken, ostrich and lamb mince variants. One can also cook it as a meatloaf and cut it into strips. Cubes of tofu, slices or quarters of hard-boiled eggs or strips of well-cooked omelette. It’s important to remember that you don’t need to use recipes designed especially for babies – just keep salt and sugar to a minimum. Don’t be overly fearful of choking: as long as you are always present when your child is eating and as long as food is soft and pieces are small, your child will learn to chew and navigate their way through finger snacks. Remember that practice makes perfect, so relax, keep it simple and nutritious, and watch as your baby enjoys this new feeding experience.